Ok first for questions. Yes I'm in the choir and it's amazing, but no we're not going to General Conference as far as I know. I'm not really sure about the shoes. I kind of want another pair. They are really nice but at the same time my old ones aren't bad, they just are a tad to big so I don't know if I will get a second pair of them. I'll get back to you on that. Yes I received all of the letters I just haven't really remembered what is in all of them and you can use dearelder.com. It's kind of nice to have something to hold when I'm writing to you because the program they use for email here is really limited. Don't worry about me not working enough. I'm the hardest working missionary in my district even though I'm the worst at Spanish. The only thing I remember from class at Eastern is the numbers for some reason. I can't really speak or understand what anyone says but it's starting to come along a little. The teaching however is great! Although Elder Stout and I don't get along like at all (we only have Washington in common) we teach really well together. I'll send you a picture of him and probably everyone in my district soon, so you can look forward to that. A little about my companion. Karyl sent a separate dearelder.com asking a little about him, so I tell you a little bit about him. He is from Moses Lake. I think I told you that. He was in the army for a year after doing 2 years of running start and getting his AA out in Moses Lake. He is actually like Mexican but doesn't know much Spanish. As for "is he driving me crazy" yet let me tell you, absolutely. Like I said, we don't get along at all. He is all about "chill" and let's take a nap and all of that kind of stuff. That is really frustrating. So we had interviews with our teachers and Hermono (Brother) Crane (who is very by the book like me and everything). I had an interview with him so I let him know about my frustration and the next day they focused on Diligence in a whole bunch of class time over the past week and so he is starting to catch the idea. He still falls asleep all the time in personal study and during the firesides which is the best part. Oh well, I do love him though, which is really weird like I don't like him at all, but I love him and we teach really great together and always have the spirit when we teach too, so it works out. Ok, so there was this one lesson that was kind of interesting (oh Karyl, I go the TEC like 3-5 times a week and our standard of excellence for just before we leave, is 15 times a week so I'll be in there a lot). This guy was acting like a real investigator he had had. The situation is that he was taking a break from school and had got a video from the missionaries a couple of months earlier and he called them back to teach him. Well as Elder Stout and I started teaching him it just didn't seem right, so after a while I just started teaching him repentance, yeah repentance, and like he got more interested and really started paying attention and the spirit was really strong. It was really kind of weird and after a little of that Elder stout calls a time out and is like "what are you doing". So then the teacher we were teaching like very tactfully said that (and I mean very tactfully) what I was teaching made sense and that is what the investigator needed to hear. So anyways the moral of the story is, sometimes the investigator needs to hear something else and the spirit knows and you just have to go with it even though your companion may not agree. So anyways I have to go get ready for the temple. We missed it last week because the consol from Argentina came and talked to us and answered questions, which was interesting to say the least. Anyways I love you all and have a great week! PS: I get to email Thursday so write me please! You're probably wondering why I'm emailing and I'll be able to give you a bit more detailed letter because on Tuesday I was really pressed for time. Well we do have email access here at the MTC through this email address which I'm sure you've figured out by now. Now before you think I'm breaking any rules by emailing today, I can assure you, I'm not! Tuesday is my P-day, but because of an MTC fireside that our zone sets up for, and because of Choir, we lose like 2-3 hours of preparation time. So they give it to us on Thursday morning. So we get the unique opportunity to email twice a week while I'm in the MTC (which by the way, I'll be here till I go to my mission which is nine weeks, May 18th I think). So now to your questions; the Temple down here was really, well I don't really know how to describe it, amazing in terms of the building so beautiful and of course a little different from Spokane but none the less amazing and Salt Lake was very cool too from the top of the Church office building. It was a really amazing view, let me tell you. You could see a ton from up there and we got pictures as I'm sure Karyl told you. The shot, well yeah, the shot wasn't so amazing (hahaha from temple to shots what a transition) actually I did kind of have a reaction then again I think everyone might have it. My arm was killing me for a couple of days I wasn't really able to use it and it's a good thing I had them stick my left arm. Yes Mom (said with exasperation and rolled eyes) I took my vitamins. OK to dad I think that you are probably trying to do all you can to prevent me from getting mail from everyone but you know you should start handing out my address and tell everyone about dearelder.com I'm feeling kind of lonely down here. So far I've only gotten stuff from you, Mom and Karyl. So please, you can let people know I'm still alive. My companion is a bit of a pain. He is always good in class but as soon as we leave, he's all about "chilling". So annoying. I basically wasted my P-day. We had like 3 hours that I could have studied, but I wasn't able to do that because none of the missionaries in the district wanted to study, and the example of our District leader (my companion) isn't helping. But he did get a talking too yesterday by Hermono Crane. Oops sorry, Brother Crane, who is very by-the-book. So that's good. Hopefully there will be a change so I can start to understand this language. Sorry I didn't write you a spiritual experience I ran out of time. So here you go. Obedience is the thing that is really being stressed here. So you know, no staying up past 10:30 to study, that kind of stuff. Be to meetings on time so on. Well the first day I was in bed a little bit late and I literally felt the presence of the spirit leave a little bit. So I can tell you that staying obedient to every rule, and even though I might not get the extra study time, I'll have the spirit in force which is what I would rather have. Well I'm here in the MTC alright and it has been so busy these last several days. As you now probably know I can email in the MTC and I get to do it on P-days which is today. 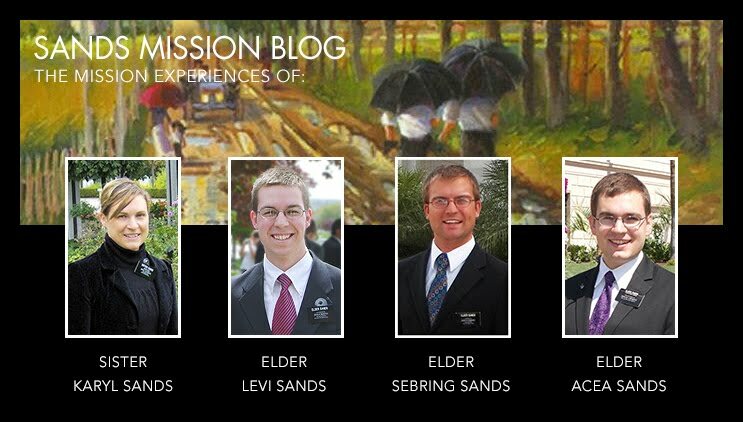 So anyways my companion's name is Elder Stout and he is actually from Moses Lake hahaha, what are the odds. That is pretty much all we have in common though. He's a great Elder although a little lax. So Spanish; I'm sure you're wanting to know about it. Well it's not going very good. I definitely know the least of anyone, that's for sure. Well it's helping with my humility that's for sure. The MTC is great and the food is good too, although I realized that I don't really like any foods more than any others too much anymore, (except of course the chicken dish Mom) it's all just food to me. Gym is a life saver! With all of the sitting around we do in class every day the ability to get up and (I run) is so great. Although I did push myself to hard the first couple of days. You know it's been a long time since I've really done any exercising so I went and ran 4 1/2 miles on Friday and 3 3/4 miles on Saturday and my knee was hurting a little after that and I'm sill sore but don't worry Dad I won't injure myself while I'm here or anything. I just kept on going because I was bored. Please tell everyone about my address or about DEARELDER.COM (It's free). Getting letters is nice and I have a few minutes when going from building to building that I can read them. So how are things at home and how did Acea's spring trip go and Sebring needs to tell me his grades when he gets them on Wednesday. Well I'm running out of time.